For string players rosin is where the rubber hits the road. Without this sticky, messy, substance the violin, viola, cello or double bass would be mute. Because we apply rosin to the bow hairs and to the area of the strings where we play, the bow is able to, roughly speaking, pluck a string at a mind boggling rate. If you play the note A, 440 cycles per second, the correctly handled bow will pluck the string at just that rate. To achieve this wonder we need to make use of the ancient and still mysterious resin. 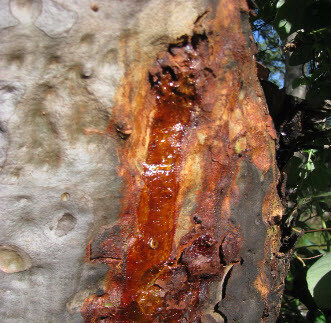 Trees ooze this substance from a deep cut through the dark to sapwood. 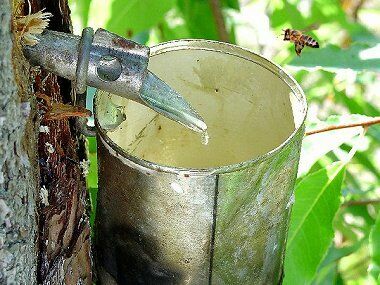 It is made in response to injury and it seals the wound protecting the tree from pathogens such as parasites and insects. Resin has been in demand for at least 5000 years, the age of a piece of resin based chewing gum found in northern Europe with tooth marks still showing. So sometimes it tastes good or relieves toothache or some other medical condition while other tree resins have desirable perfumes like frankincense and myrrh which produce aromatic smoke known since ancient times. Pliable resin, pitch, can be made in bulk by distilling vapour given off by heated pine wood. Pitch was once used extensively for caulking boat joints. Even buried resin has value since time and subterranean heat and pressure changes it to beautiful amber. The Greek word for amber is eleckron and the ancient scientists discovered that if you rubbed cat fur with amber an amazing new substance, like lightning, appeared which they called electricity. An even greater discovery was made elsewhere, probably in Asia. One use of rosin was most likely discovered in Asia and allowed the birth of bowed music. This property is that the dynamic or sliding friction of rosin is very much less than its static friction. This is not always the case, when you shove a chair across the room you see that the dynamic friction is only slightly less than the static friction which you had to overcome to get the chair moving. In bowed instruments the neat friction property works like this. As you bow, the rosined bow hair grabs the string and pushes it laterally, static friction holds bow spot and string together and there is no relative motion between them. The force the bow exerts on the string grows at a steady rate, graphically it could be shown as a rising ramp, and the string exerts an opposing force. Eventually the opposing force of the string reaches a point where the sum of it and a subtle force to be discussed later, which we will call the kink force for now, overcomes the static friction and the string shoots back restrained by only the very low dynamic friction. Graphically the ramp drops off a steep cliff here back to its start level. This is where the “plucked” string is released and is momentarily free to move like a guitar string. It soon however rebounds and starts moving in the same direction as the bow hair and as soon as the two have the same speed static friction takes over again, the bow hair grabs the string, and another cycle is started. This cycle is called the “stick slip cycle” and the repeated ramp, cliff graph is called a saw-tooth input. So rosin makes possible a saw-tooth driving force to a string which is transferred via the string to the bridge which rocks from side to side producing the violin’s rich timbre. A series of saw-tooth inputs produces all the harmonics strongly giving violin makers and players a good basic sound spectrum to draw on. A more accurate description of what’s happening will now be given. A demon plucking the string at 440 cycles per second could not produce good violin tone, it’s more complicated than that. Instead a wave phenomenon, rosin and the player’s skill can accomplish what’s needed. To see how not much knowledge of waves in strings is needed beyond what can be gained by tying a rope to a post, giving it a flick, and watching a clear wave pulse glide away to the post and may be get slightly reflected. The kink, which is slightly rounded, is the result of the sudden slip and is like the rope pulse mentioned above. The wave travels at a speed determined by the string tension and density in accordance with usual wave theory. For the fundamental tone the string is half a wave length long and the round trip for the wave kink will therefore take one wave period. When the reflected and inverted kink arrives back at the bow after one period, with each string segment now having a force component in the same direction as the force the string is already opposing the bowing with, a suddenly larger force is produced. This breaks the static friction and starts the slip phase at exactly the right moment. The slip impulse re-energises the kink which travels on and is reflected off the bridge and then reaches the bow where it helps to pull the rebounding string up to bow speed thereby starting the next stick phase. If the bow pressure is too great when the kink arrives the total force won’t be enough and the string will be forced further out by the bow until, unsynchronized, a slip starts. Waves will conflict and an unpleasant scratchy sound will result. If the bow pressure is too light the slip will start too early and whistling scratching will result. By listening constantly to these feedbacks the player learns to apply the correct pressure. If more volume is required, without changing timbre, the bow is moved faster thus drawing the string further out thereby increasing the amplitude of its motion which results in more sound. If the level change is big enough more bow pressure will be needed as well. If a richer sound is required the bow hair is moved closer to the bridge and the bow pressure is increased. This results in a sharper kink and a sawtooth with a steeper cliff and therefor stronger harmonics and a richer sound. Thanks to rosin again the tone produced does not become boring. Random slips occur due to the random thickness of the rosin coatings and the oddities of grains and crystal impurities and they add grit to the tone especially in sforzando playing which can really crackle. It has also been suggested that in the slip phase or even at the slip threshold the rosin melts or at least softens thereby reorganizing its grains and adding novel effects. For example high bow pressure near the bridge could promote softening and as a end result richer tone. Rosin also plays a part in twisting effects. As the bow slides it twists the string up slightly along its length. When it slips it unwinds perturbing the kink in some way which could affect the “stick” instant and the twisting also dissipates bow energy thereby providing damping. Finally, too generous use of rosin results in non-stop scratching and insufficient rosin results in whistling or dead tone due to compensating with heavy bow pressure. Theorists believe that rosin is the least well understood string instrument essential so important discoveries may lie ahead that will facilitate good bowing. Then scratchy bow starts and turnarounds will then be a thing of the past like scratchy vinyl records and violin teaching will become an even greater pleasure. Like all the other violin accessories rosin comes in a range of qualities and being inexpensive one an experiment freely. Thrown out stuff can be used for soldering flux, sealing wax, incense, varnish, dye, rock climbing grip improver, or simply recast into brand new blocks and reused in its original and grandest role. As with the bow, the rosin is a vastly under-appreciated and indispensable tool for any string musician be acoustic or electric. Nor does one size fit all, with a wide range of grades and qualities being currently sold commercially. The source varies also, with any resinous tree sap with the right melting point technically possible to turn into usable rosin. Traditionally, however, it is normally sourced from pines and other coniferous trees. Without it, the hair on the bow will have no friction on the strings and therefore produce no sound. With this in mind, the right treatment and use of rosin are absolutely integral to a stringed musician of any level or discipline. The process of extraction varies from by hand for artisan level craftsman to a more mass produced approach for major commercial distributors. For the purposes of the article, I will describe the typical process of a mid-range manufacturer. It is interesting to note that most rosin manufacturers maintain a strict secrecy over their recipes, which makes discerning the finer points of what makes the particularly fine rosin exceptional over that of the merely adequate. Think of it like a quality distillers pride in their product, as there is hotly contested debate over which is the finest brand. After the pine trees are harvested for their wood, the rosin manufacturers take the leftover elements of the wood and pulp. They are then “digested” (think along the lines of distillation) from the raw material into oleo-resins, to which then turpentine is added to form “tall oil”. This mix is a crude version of the rosin you would eventually use, comprising of pitch, fatty acids (primarily abietic acid) and residual plant resins. The main differences between each brand come in at this point. Some place in more additives, ranging from beeswax, other saps from trees like firs or spruces to twenty-four carat gold! This is all focused on increasing or refining the grip of the rosin while reducing the dust produced by the action of the rosin, which makes for the messy job of cleaning the strings. Once the desired additions are prepared, they place the “tall oil” into a boiler to begin the final process of refinement. Slowly it is heated, reaching temperatures of over a hundred and forty degrees Celsius at its peak. Gradually, it reaches a consistency similar to hot molasses. 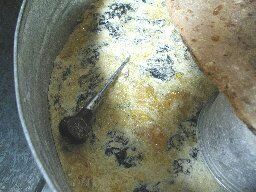 Before it is finished, it must be allowed to “rest” (cool and thicken slightly), during this process, some manufacturers use a hand torch to prevent glazing and draw any bubbles to the surface. Depending on the makers’ preference, the rosin is then placed into sap-gum wood which forms a cradle to house the rosin and protect the user from making a mess. The other generally more expensive alternatives are to anchor it onto cloth, a spindle and case model or decanting it into a decorative container. It is important to note rosin has a best before date, generally most effective within eighteen months of manufacture. Not all rosin is created equal, and not all rosin can be used across the range of stringed instruments. Depending on the time of collection, its colour can range from gold to amber in midwinter or spring and has a hard finish. In summer to autumn, the resin is darker and retains a much softer consistency. This becomes more relevant when it comes to deciding which rosin to choose for your own use. At a beginner-student level, it’s much more cost effective to buy cheaper rosin but it will result in more dust and consequently more necessary cleaning maintenance of the strings and under the strings where the bow is pulled. It will also affect the tone slightly, with a less refined, more gritty sound, perhaps not a problem or even desired for bassists or jazz musicians. The more expensive rosins have been refined from higher quality resins. They have therefore greater sound fidelity and are so much more useful to advanced students or to professional musicians. The next step in the process is to make a choice on light or dark rosin. Sometimes it’s referred to either winter (gold to amber) or summer (darker) rosin based on when it was extracted. Darker rosin is softer and considered by some experts to be more suited to the lower stringed instruments like the cello and double bass. Lighter rosin conversely is considered to be more suited to the higher register of the violin and viola. There is also the caveat of climate, which is not much of an issue in some countries, but if the player was to travel to widely different climates regularly, it is worth noting. For example, dark rosin’s sticky quality can become a detriment to the finer bow action in tropical areas. For the most expensive rosins, some artisans add precious metals, which affect the static friction of the resin to help achieve the desired sound. Gold adds a warm clear tone and is suitable for all instruments. Soloists sometimes note that it can soften the harsher notes and assist in producing defined notes. Silver lends itself to concentrated and bright tone (best employed for the higher positioned instruments). Copper is the most distinct of the metal additions to rosin. It is a great addition to a beginner’s arsenal in that it makes for a beautiful, warm yet soft tone.